Military Grade - Stainless Steel CELCIUS Tactical Pen (Patended) is the world first and only tactical pen with extendable barrel (Hidden Blade). Size does make a difference! This Limited Edition embodies elegance, refinement and cutting-edge technical innovation. 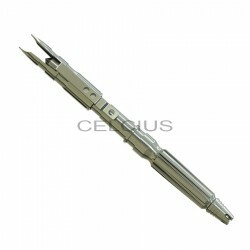 CELCIUS Tactical Pen (Patended) is the world first tactical pen with extendable barrel (Hidden Blade). Size does make a difference! If you are serious about self defense you need to be carrying some type of weapon in daily basis. CELCIUS Tactical Pen is a high-quality pen that specifically designed for improvise self defense weapon. Most purpose designed weapon like knife or gun are not allowed to be carry around. In other way, the attacker may be carrying a weapon in some ways. In most cases, attacker often has some more advantages over you. He may be stronger, bigger, or he may have friends with him which mean you facing multiple attackers situation. Anyone in those circumstances, having a weapon could make all the difference. CELCIUS Tactical Pen CTP-01 is the most advanced tactical pen on earth. Be prepared and make sure that you have the right tool for the job. CELCIUS Tactical Pen offer extendable barrel (tactical blade), glass breaker, and DNA collector to enhanced utility, allowing you to be prepared for anything.